The 2016-2017 PBA Philippine Cup quarterfinals saw San Miguel Beer dispose of Rain or Shine, while Ginebra forced a do-or-die game against Alaska. The No. 1-seeded San Miguel Beermen advanced to the Oppo PBA Philippine Cup semifinals after dumping the Rain or Shine Elasto Painters, 98-91, in their quarterfinal match on Sunday at the Ynares Center in Antipolo. RR Garcia gave San Miguel a nice surprise, exploding for 25 points from off the bench. 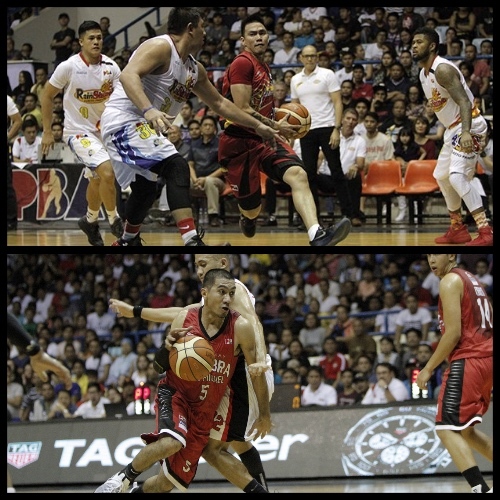 He shot 5-for-7 from beyond the arc and scored 12 points in the fourth quarter, where the Beermen put the game away. The Barangay Ginebra San Miguel Kings showed great mettle as they overcame a 17-point third quarter deficit to beat the No. 2-seeded Alaska Aces, 85-81, on Sunday at the Ynares Center in Antipolo and force a knockout game in their Oppo PBA Philippine Cup quarterfinal series. Ginebra hammered Alaska, 33-13, in the third period to swing the game in their favor after a rough first half. LA Tenorio scored a team-high 16 points – all but one coming in the second half while Japeth Aguilar and Scottie Thompson both notched double-doubles. Aguilar tallied 15 points, 14 rebounds and three blocks while Thompson posted 15 points and 10 boards in the game.